How great are the benefits of push ups? Anyone reading my routine over the last year knows how push ups have been an integral part of my program. You can find an excellent push up workout program to get better at pushups here. This program is excellent for beginners and advanced. I am always searching for new information about the exercises which have changed my life. Push Ups, along with squats and deadlifts are one of the big three. Push ups are not just one of the best upper body workouts you can do. They are also a total body workout. Go ahead, get down on the floor and do 30 pushups. You will of course feel the burn in your chest and shoulders. But, because push ups are a full body compound exercise, you will also feel the results in multiple major muscle groups. Push ups are a great form of exercise for several reasons. First, a push up is something that anyone can do. Whether or not you have money to spend on fitness equipment. Second, push ups do not require any extra skills, making them a possible form of exercise for anyone. Third, the results of consistent push ups are visible after a relatively short period of time. 1. Push ups do not require money. Just get down on the floor and do push ups. What is more simple than that? I have been doing them in my apartment! You can do your push ups on a hardwood floor or a carpet. You cannot beat a floor for your main piece of home gym equipment. Yes, I open the windows, get some fresh air and then do sets till I reach 100. I always start with my max for that day which fluctuates. One day it can be 56, my highest, getting close to 60! And one day it can be 35 like today. 2. Push ups do not require special skills. But, the benefits of push ups can help you get stronger and even do better at daily activities like bowling. Push ups are the original form of weight training, using your own body weight! A natural weight bearing exercise that works multiple muscle groups, even your core muscles. 3. You can see the amazing results, the benefits of push ups in a relatively short period of time. It is fair to say that you can see push up results after a couple of months. And even more so, after six months, and a lot more after an after an entire year. Push ups work out every part of your body. Many people don't realize just how many muscles of the body push ups target. For example, push ups work your fingers and hands. Push ups also work your biceps, triceps, shoulders and forearms. And do not forget that push ups work your upper and lower back, and even your abdominal muscles. In addition, they strengthen your leg muscles, including your hamstrings, quads and calves. Push ups are an incredible full body workout. The powerful benefits of push ups can help to transform your entire body. This is why push ups are a mainstay in armies all across the globe. Push ups are one of the big three exercises that I did for six months, along with squats and deadlifts. Losing 75 pounds in 6 months without starving is not bad. Taking 18 inches off your waist is even better. You can see that push ups fuel both weight loss and building muscle. And all you need is a floor. The benefits of push ups, squats and deadlifts, have that power. 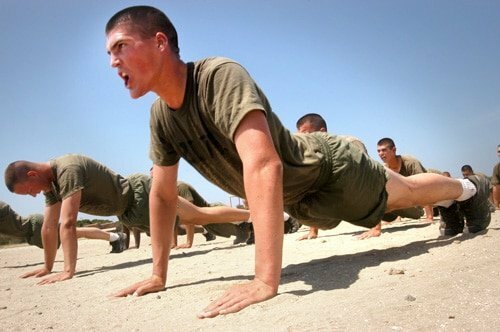 If you want to lose weight, belly fat or a total body transformation, push ups are for you. Push ups are not easy to do, especially in large numbers. However, with consistent practice and dedication to improving your form, you can build your endurance levels. That, in turn, makes it possible for you to move on to bigger and more demanding forms of exercise. Whether you're a bodybuilder or not, muscle growth is an important part of your health. More muscle means a stronger, healthier body and they create lean and defined lines throughout your body. By gradually increasing the amount of push ups you do, you will notice an increase in muscle mass. In addition, push ups also produce a human growth hormone that helps boost total muscle growth. Push ups help you avoid injuries when doing other weight-training exercises. This is especially the case if you warm up your body with push ups before each workout. Push ups are such a total body conditioner. As a result, you'll find that doing other forms of weight training comes easier for you. As a result, you'll be less likely to strain your muscles and cause an injury. Here is some anecdotal evidence of the power of pushups. I suggested that a friend start a push up program. He is rebuilding his life after divorce. He was reluctant to start a push up program, because his shoulders felt very weak. I told him that as long as his doctor agrees, pushups can help make his shoulders stronger. He started with a few push ups. Several months later, he saw the immediate results of building strength with push ups. Now he is able to do 30 push ups in a row. He looks and feels more fit, not bad for 3 months of push ups only! Gym memberships are costly. Fancy fitness equipment is also expensive and prohibitive. Many times, home gym equipment ends up as a shirt hanger. Push ups, on the other hand, aren't just inexpensive—they're literally free to do. That means you won't spend a lot of money on a piece of equipment that goes unused. Therefore, you don't need to enter a gym in order to do a push up, either. This makes them an extremely attractive form of exercise. Especially when you consider the effects of push ups on your entire body. Besides the other benefits of push ups that accompany consistent push up routines. If you do not have access to weight lifting equipment, and even if you do, push ups are a great assistance or stand alone exercise to help improve your bench press. So, will you start a push up workout program today? Remember, you can find an excellent push up program here. Or you can keep it really simple. 3 or 4 times a week, do as many sets as it takes you to reach 100 push ups. Keep a record of how long it takes you to get to 100 and always try to beat your record. Until you can actually perform 100 in a row. And then continue to do your 100 pushups 3 to 4 times a week. Have you been doing push ups for many years? Or how long ago did you stop doing push ups? Please share. In the meantime, time to do some push ups!